I add my testimony to these, that our Savior lives and that the resurrection is real. Hi everyone! It's Friday - yay! I originally posted these last year, but thought it would be fun to share them again. Click on the title of each to go to the original post with lots of pictures and detailed instructions. 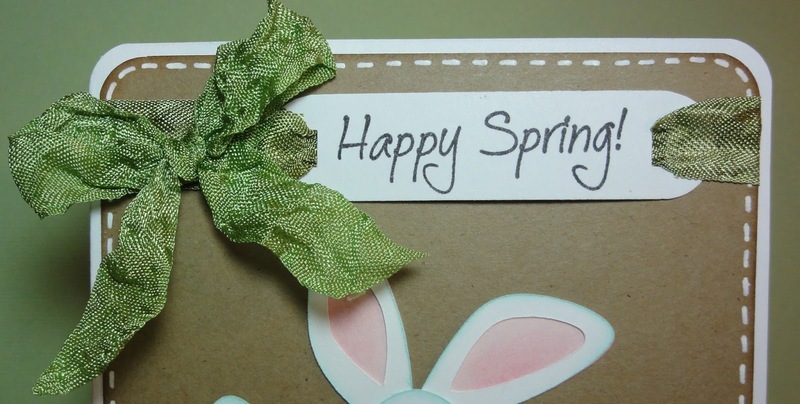 DT post by GiGi - Happy Spring! There are 2 posts today, so be sure to scroll down to see the winners for challenge #91! Hello everyone! 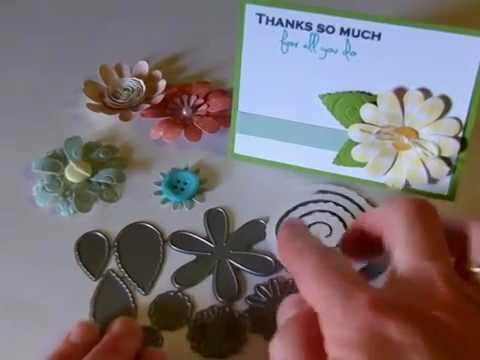 This is GiGi from The Cricut Bug here to share I card with you. I can't believe Easter is this weekend already...where does the time go? 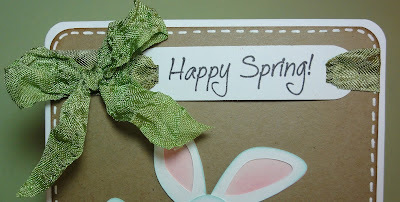 I used My Craft Spot's Butterfly Kisses stamp set for the sentiment and some Todally Green crinkle ribbon. 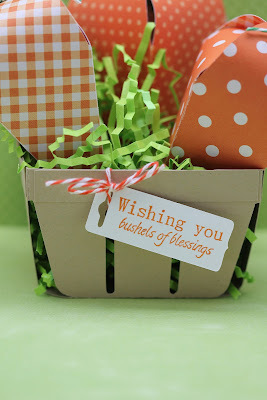 I wove the ribbon through a sentiment banner and tied a bow with Todally Green Crinkle Ribbon. The bunny was cut using my Cameo and a file from the Silhouette store. I stamped the eyes with some Peachy Keen face stamps and did a white stitched line around the card. The grass was cut from Paper Doll Dress Up and I rounded the corners of it to fit with the mat. 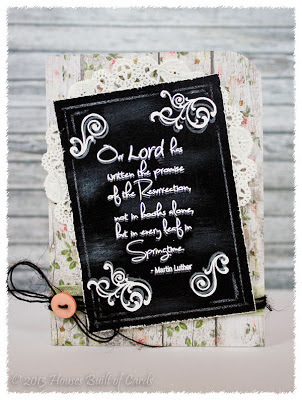 I stamped the sentiment using My Craft Spot's Butterfly Kisses stamp set onto a banner and punched holes in the sides. I then wove the Todally Green crinkle ribbon through the sentiment banner and secured it down with tape. To finish I added the bow to the corner. I hope you all have a wonderful Easter and thanks for stopping in! Winners from challenge #91 - Embossing & Glossy Accents!! 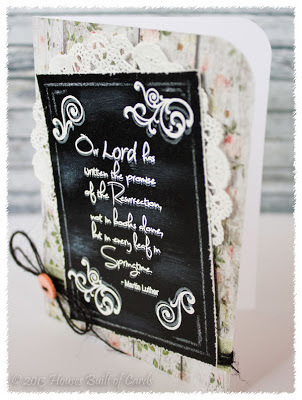 We had so much fun looking at all of your embossed projects! Thanks for joining the fun!! 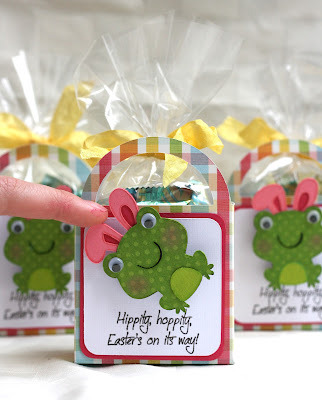 DT Post by Ally - Hippity Hoppity Easter's on it's way! *Hippity, hoppity, Easter's on its way! 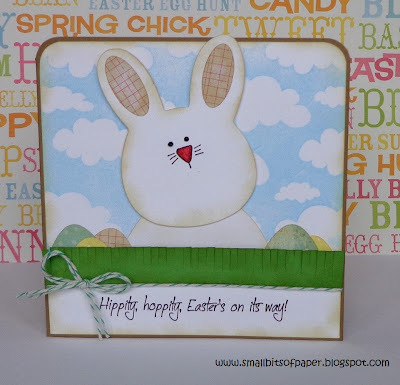 * is from the Happy Easter stamp set by My Craft Spot. I tied a bow with some sunshine yellow crinkle ribbon for that great pop of color. The frog is from the Create A Critter cartridge cut at 1.75". The ears are from the Create A Critter 2 cartridge cut at 1.82". The boxes were from the Slumber Party cut at 2.75". The white layer was also cut at 2.75". This is a great size for treat containers. I hot glued an action wobble to my little *bunny*. Hot glue helps keep everything attached--for lots of hopping. I love to tie Jute String and Bakers Twine around my creations! 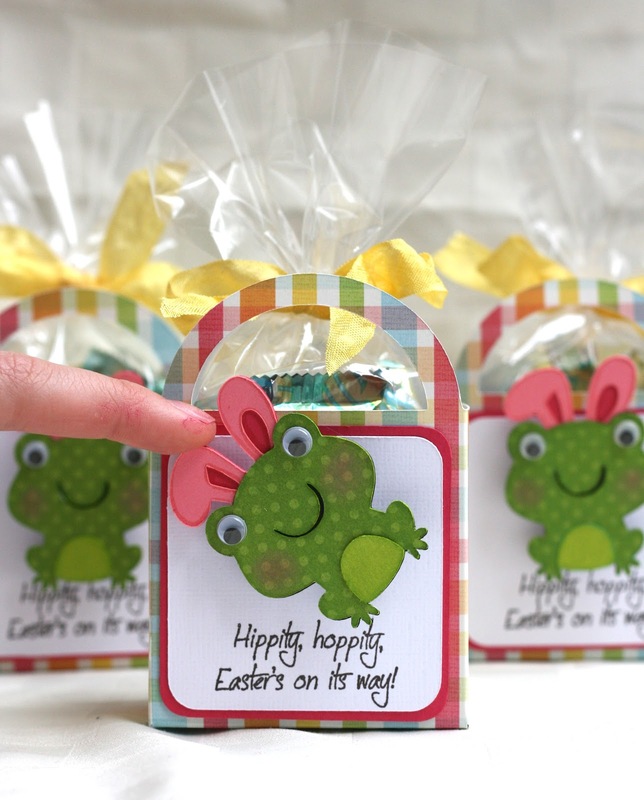 It is also the perfect way to attach tags and other fun embellishments. Gwen's basket of carrots is super cute! 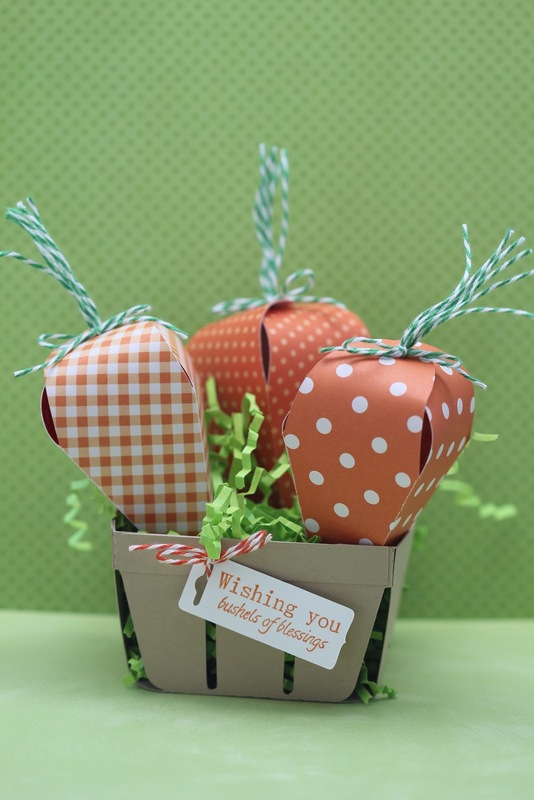 I love how she made carrot tops with Peapod bakers twine! 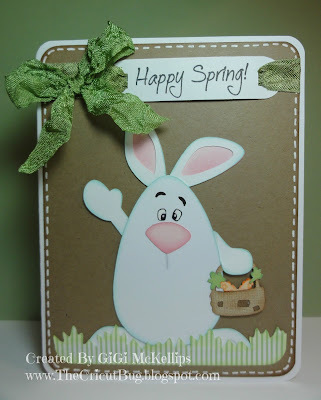 The patterned papers she used for the carrot are so fun! Gwen tied her tag to the cute basket with Mandarin bakers twine. 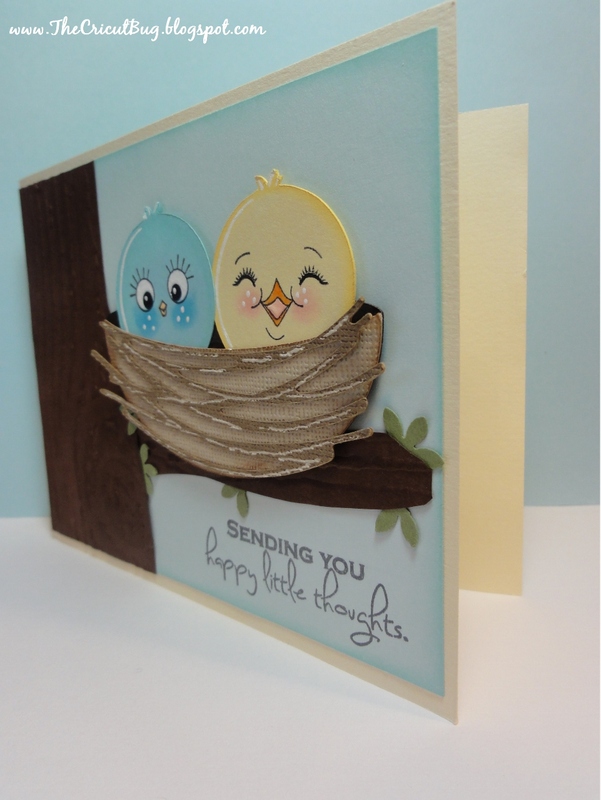 Her stamped sentiment is from the Happy Thanksgiving stamp set. Sherrie's owl is so cute!! I love the pen work and her fun tag! Sherrie cut her tag from the Lacy Banners metal dies and stamped it with a sentiment from the Tiny Tags stamp set. She tied everything together with paper cord and Kraft bakers twine. 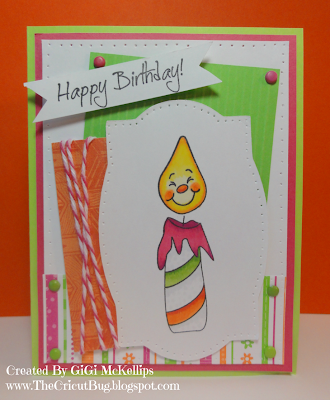 Gigi's birthday candle is adorable and I love all of the fun layers on her card! 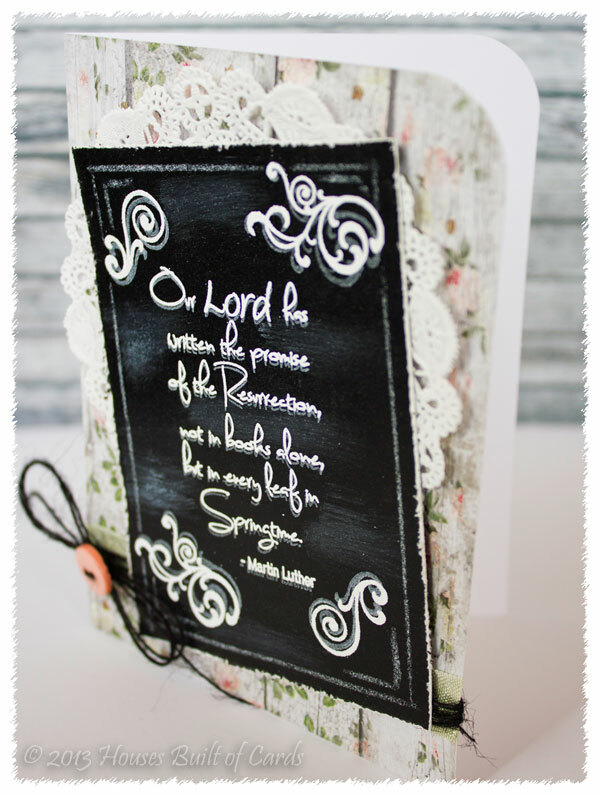 Her stamped sentiment is from the Birthday Wishes stamp set and she tied Strawberry Cupcake Trendy Twine around one of her layers. 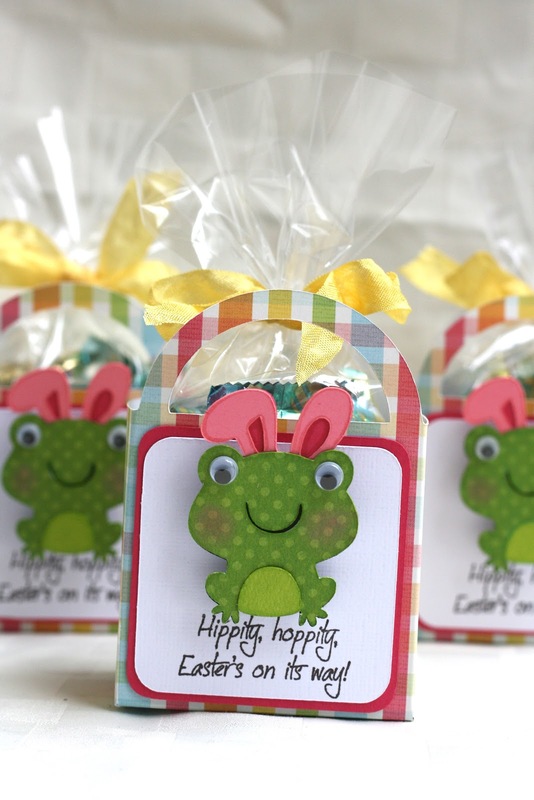 I love Ally's beautiful Easter pillow boxes! The rosettes are gorgeous! The Posy baker twine bows are so pretty with the pearl in the center! Ally used two banners cut from the Lacy Banners metal dies to make her pink banner. She cut her tag from the Tiny Tags metal dies and stamped it with a stamp from the Best Witches To You stamp set. Kate's bunny is super cute and I love the cloud paper background! The fringe cut grass is fun too! 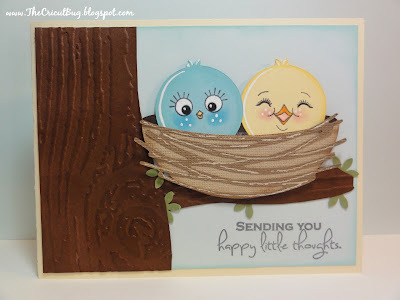 Kate's sentiment is from the Happy Easter stamp set and she tied Spring Green bakers twine around the bottom of her card. 10 yards of each color of Jute String!! Fun Octopus card from Animal Antics! I added a bit of glossy accents to the side of her head and to her bow. The octopus was cut at 4.5 inches from the Animal Antics cratridge. (This cartridge is a Cricut Circle exclusive.) There are so many cute cuts out there on other cartridges that you could get the same look with. I wanted this card to really pop, so I used A LOT of dimensionals. These are from Stampin' up and I love how thin they are - just right for lots of layers! I tied a button on with Natural Jute Twine. The card base (folded over) is 5 inches wide by 3 1/4 inches tall. I let the bottom border hang over about 1/4 inch on each side. Winners from Challenge #90 - Sweet Baby! You won the Bundle of Joy Stamp Set! 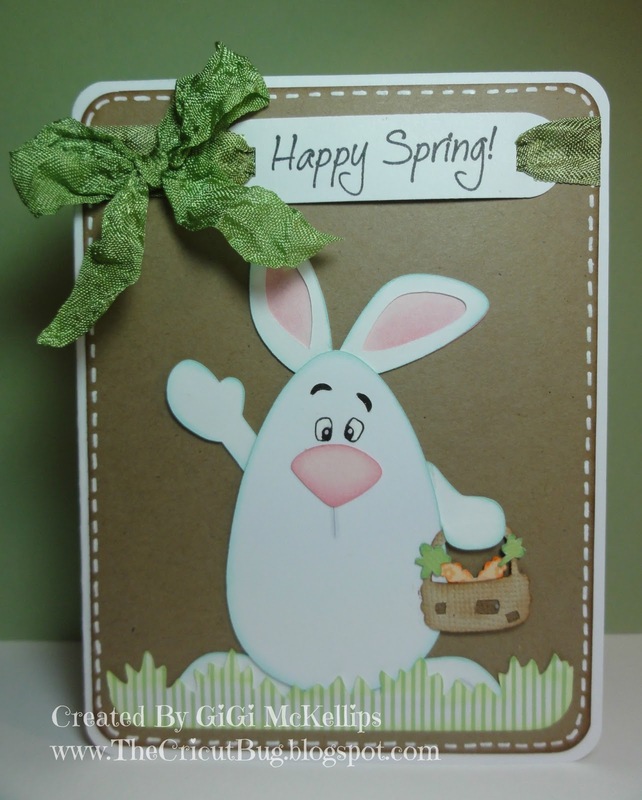 DT post by GiGi - Adorable Bunny card! Hello everyone! This is GiGi from The Cricut Bug to share a card that I made using My Craft Spot's Butterfly Kisses stamp set. 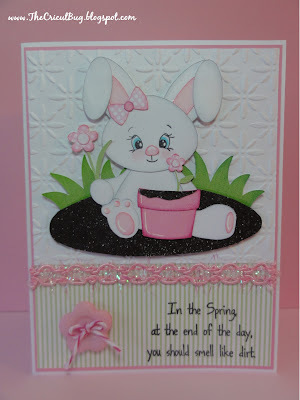 This card also fits in with the challenge this week which is "Embossing". You have until Monday to get your project in. I added some Strawberry Cupcake Trendy Twine to the flower button. I cut the bunny using my Cameo and a Kristi W cutting file called A Hunting We Will Go. I also added an oval of dark brown that inked with white for the dirt. I cut a small piece of the inked brown and also added it to the pot. I stamped the face with a Peachy Keen Teddy Bear face but kept her nose the same. The background white was embossed using the Cuttlebug Baby's Breath folder and I added some pink trim to the card. I added a flower button with a Strawberry Cupcake Trendy Twine bow and stamped the sentiment from My Craft Spot's Butterfly Kisses stamp set. I hope you all liked my card today and thanks for stopping in! Have a wonderful day! 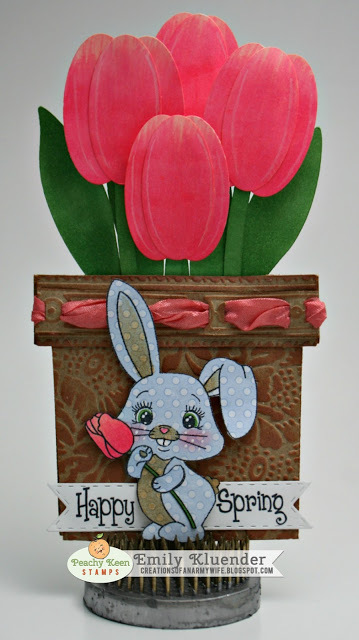 DT post by Sherrie - Some Bunny Loves You! Hello Everyone! This is Sherrie from Sherrie Scraps with Passion. 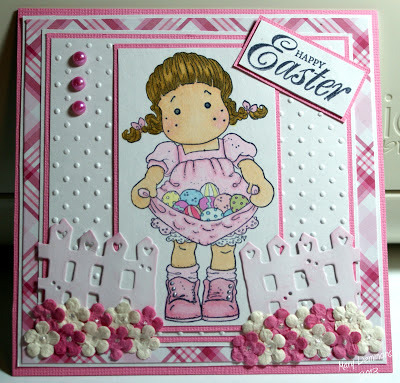 I have a card to share with you using My Craft Spot's Happy Easter stamp set ad the Lacy Banners Metal Die set. My card base is 5 1/2 x 5 1/2. I used some older pattern patters that are from SU that I really needed to use up. I cut a 2 x 5 1/2 piece along the top adding a border using a fiskars border punch. I then layered a Spellbinders Floral Oval followed with a Spellbinders Classic Oval which I inked around the edges using Tim Holtz~victorian velvet. 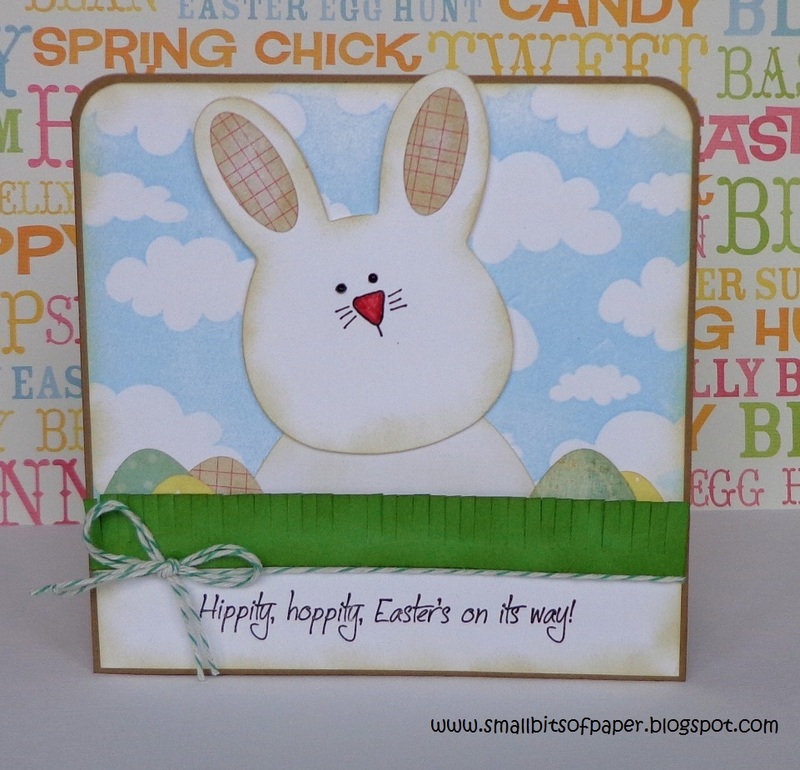 I popped this adorable bunny using the PKSC-15 Mar 2013 stamp set which I stamped and then paper pieced together. I colored in the eyes some, then added glossy accents, rosy cheeks and freckles. GiGi's birds are absolutely adorable! I love the embossing on her tree too - looks so real! 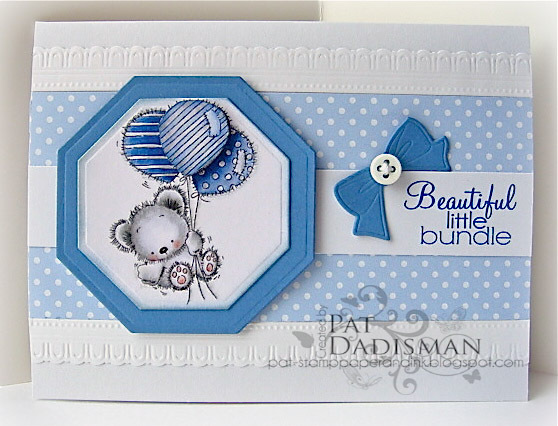 GiGi's sentiment is from the Butterfly Kisses stamp set. 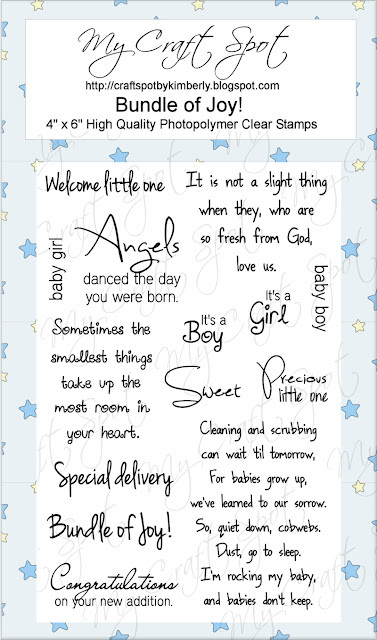 Heather's card is gorgeous! I love the chalkboard look! 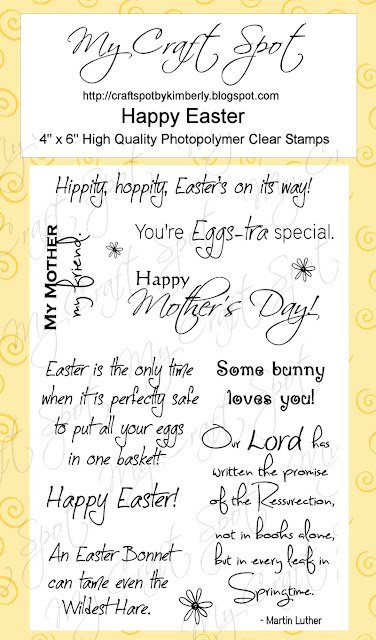 The sentiment is from the Happy Easter stamp set and the flourishes are from the Tiny Tags 2 stamp set. Heather added a bit of Spring Moss crinkle ribbon and some Black jute twine. Robin's card is so pretty! The embossing on her pot is amazing and I love the cute tag! Robin cut her tag with the Tiny Tags metal die set and tied it on with Natural jute string. The stamped sentiments are from the Friends & Neighbors and Tiny Tags stamp sets. Click HERE to see all of the fun stamp sets at My Craft Spot! Winners from Challenge #89 - Tasty Treats!! Spring . . . Let's party! DT post by Sherrie - You make life sweet! DT post by Heather - Sweet Birthday Wishes! Winners From Challenge #88 - Pop It! DT post by Gigi - Cute cookin' bunny!